A new image, from NASA's orbiting Solar Dynamics Observatory, reveals the enormous hole as it was Oct. 10, taken at an ultraviolet wavelength unseen by the human eye. To an ordinary observer, the gaping hole would be invisible, though you should NEVER stare at the sun because serious eye damage can result. Coronal holes, like the one that materialized last week, normally form over the sun's poles and lower latitudes, more often when the sun is at a less active point in its 11-year cycle. They are areas within the sun's outermost layer, called its corona, which are lower-density and cooler — that, plus the weakened magnetic field, lets the plasma and charged particles that make up the corona stream out more easily in a solar wind. If aimed toward Earth, that spells the makings of a geomagnetic storm: a phenomenon that can affect power and navigation for satellites orbiting the Earth as well as radio communication. A Solar Dynamics Observatory image published by the National Oceanic Atmospheric Administration reveals the huge coronal hole as it was yesterday. Continuing its march solar west (to the right), the hole is still releasing an extra-fast solar wind in Earth's direction. Another side effect of a geomagnetic storm is enhanced northern lights: the glowing auroras that often form in the night sky over the northernmost reaches of the planet grow much brighter and can even extend much farther south than usual. (Last week, the National Oceanic and Atmospheric Administration's [NOAA] Space Weather Prediction Center in Boulder, Colorado, initially predicted auroras to be visible as far down as Pennsylvania, Iowa and Oregon, although they didn't ultimately appear quite so low.) Geomagnetic storms and auroras can also be caused by other sun phenomena, such as solar flares and coronal mass ejections, which both blast the corona's material outward because of increased magnetic activity. 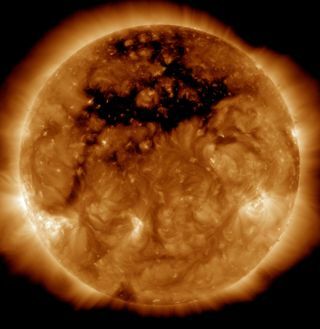 As the coronal hole continues its slow march westward on the sun's surface (to the right, from Earth's perspective), solar winds will stay strong, NOAA officials said in a statement, which may lead to additional minor geomagnetic storming. Thus, bright auroras will likely continue — at least around the Arctic Circle.